You are here: Home / Galaxy Note 4 How-To Guides / How to create own vibration patterns on Galaxy Note 4? Galaxy Note 4 allows you to create your own vibration patterns. In other words, you can customize Galaxy Note 4 vibration patterns similar to customize your Galaxy Note 4 ringtones. You are no longer limited to the pre-installed vibration patterns. This is a long anticipated (overdue) feature for some Galaxy Note users who don’t like the pre-installed vibration patterns. 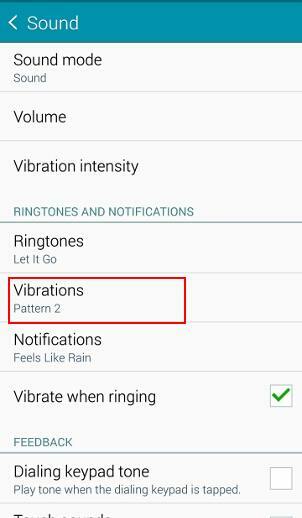 Whenever you set vibration patterns, you can access the option of creating own vibration patterns on Galaxy Note 4. So, there are many different ways or entrances to access this feature, for example, when you are setting vibration patterns for the message notification, or setting vibration patterns for an individual contact. Please note, once a vibration pattern is created in Galaxy Note 4, all apps can access the vibration pattern, just like a pre-installed vibration pattern. 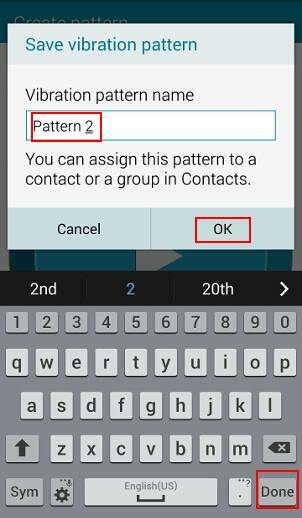 For example, you may create a new Galaxy Note 4 vibration pattern when you set vibration pattern for a contact. Once you finish the creation, this vibration pattern will be listed together with all pre-installed vibration patterns in other apps. To start to create own vibration patterns on Galaxy Note 4, you may go to Settings–Sound. 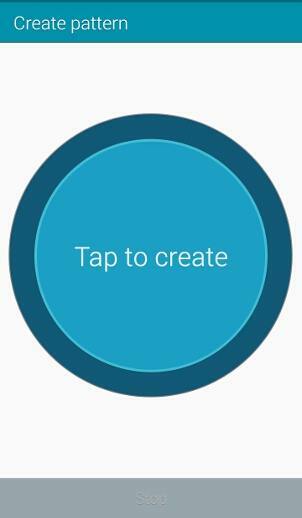 Tap “create”, instead of selecting one from the list of available vibration patterns. 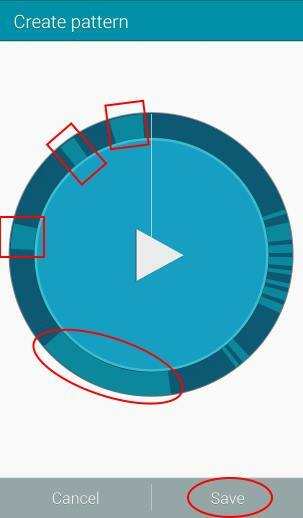 Now you can create you own vibration patterns by tapping the blue area designated as shown below. You can stop recording the vibration patterns at any time. By default, Galaxy Note 4 will use one full circle (about 15-20 seconds). You can play (preview) the vibration pattern you created by tapping the play button. Of course, you can visually check the vibration pattern by looking at the shaded bars in the outer ring. If you are happy with the new vibration pattern, you can tap Save to save it. Otherwise, tap cancel to record a new vibration pattern for your Galaxy Note 4. After tapping save button, you will be asked to name this vibration pattern. You can give this customized vibration pattern a meaningful name so that you can remember and use it easily in the future. You need tap OK after finishing the naming. Now, this new vibration pattern is applied. In other apps, when setting the vibration patterns, you can also use this customized vibration pattern. Can you customize Galaxy Note 4 vibration patterns or create own vibration patterns on Galaxy Note 4? If you have any problems or questions to customize Galaxy Note 4 vibration patterns or to create own vibration patterns on Galaxy Note 4, please let us know them in the comment box below. Is there any way to create your own vibration pattern on samsung note 4. Please, please help? I recently received a replacement samsung note 4 as my original had a crack on the screen. Now i find that this replacement does not have the option to create my own vibration pattern. Please help? Any suggestions/solutions? Creating own vibration pattern was removed in Marshmallow update. My Sprint Samsung Galaxy Note 4 has recently been updated to Android 6.0.1 Marshmallow & since there seems to be no option to create custom vibration pattern as there was in Lollipop 5.1.1. I looked everywhere, hard reset the phone for that (and another oddity post OS update). Can you look into this, I can’t find a store or anyone w/the same model phone I have to check if it’s update wide or an “issue” with my device specifically. Thank you. The feature (customized vibration pattern)was removed in Android Marshmallow update for all Samsung phones. Thanks for the reply. I just don’t understand Samsung’s design logic. I used this very creative feature for certain contacts. Samsung has it in the Galaxy Note 5 and S7 series on Marshmallow. Why take it away on the Note 4. No, you cannot create your own vibration pattern in Note 5 and S7 either. It was removed from TouchWiz skin. It doesn’t make sense why they would remove it.. i loved that feature and now its gone. Just another thing that samsung has done to push me further away. The custom vibration pattern works only for Samsung apps. If you are using Hangouts or your carrier’s messaging app, this will not work. If you are using the Samsung Messages app, you may also try to reboot the phone to see whether it helps. If you got the recent update I think that may be the cause. I’ve checked the settings to change my message vibration and there is no option to change it only for phone calls.